I applaud and encourage the Florida Times-Union employees. I hope my local newspaper, the St. Augustine Record, follows the example of their colleagues in Jacksonville. Three cheers! The Sarasota Herald-Tribune and the Lakeland Ledger unionized in 2016. On Tuesday, NewsGuild-CWA announced that staff at the Florida Times-Union started a process that will lead to a vote to unionize. If the drive is successful, it will become the third GateHouse newspaper in Florida to do so. The Lakeland Ledger and the Sarasota Herald-Tribune both unionized in 2016. According to the press release, the staff is pushing to unionize for fair wages, a voice in the future of the newspaper and for workers’ rights. The Times-Union joins other legacy newspapers in the move. Our union is under no illusion that revenues associated with the news business will magically improve, and that is precisely why we have decided to unite our voices. We fear that GateHouse’s short-term strategies will lead to more and more cuts in the future. As of today, there are fewer than 40 full-time employees working across the Times-Union newsroom in metro, opinion, life, sports, photo and the copy desk — a third of the staff we had just five years ago. Once-filled desks now sit empty. There will be tough times ahead. A union won’t necessarily stop that. But a strong contract will help to protect the work of the men and women who report, edit, photograph and put together the stories of the newspaper. In this way, a strong contract will help to preserve good jobs and impactful journalism in Jacksonville. Palka spoke with Poynter at the beginning of the year after another round of layoffs and how she approached reshaping an ever-shrinking newsroom. "We weren’t going to be the newspaper of record in the sense that if you don’t see it in the paper, it didn’t happen," she said. "We’re going to be the paper of record for the most important things in our community." "...I don't think the Guild's push for fairness and a voice has become obsolete," Edmonds wrote. "Maybe here, as in other nooks of the industry, there is reason for cautious optimism that traditional roles and goals can adapt to the times." Kristen Hare covers the transformation of local news for the Poynter Institute. Her work for Poynter has earned her a Mirror Award nomination. Worker's rights? Florida has already written these laws. Florida is an at will and right to work state. You can fire a union member or non union member any time for any reason and you can't be forced to join a union. Media unionization in Florida is largely ineffective. The owners of a depreciating asset have every right in the world in the slash costs and cut staff whenever they choose. It is their company, not the journalist's or the outsider union's. 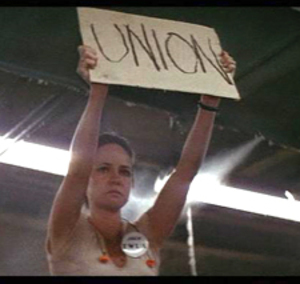 What does the sales staff at the Times-Union feel about a union? A union in the newsroom effects the whole company's finances. What about the marketing staff? What do they think? What will be the cost of having a third party labor union in the newsroom? We don't know if other people in the company support a union because the only voices journalists at media companies give voice to is themselves. Is Greg a disgruntled employer? Sounds pretty uninformed. Faux Fox News viewer? Florida is a right-to-work state, but union members working under Guild contracts in Florida still can benefit from "just cause" protections when facing discipline or termination. That means Guild members, even in Florida, cannot be fired at any time or for any reason if their contracts contain "just cause" protections. Right-to-work means union contracts in Florida can't require that members of a bargaining unit join a union and pay dues. These non-dues-paying members still, by law, must receive any union-negotiated pay raises and fair-workplace protections such as "just cause." Right to work doesn't restrict any other terms of a union contract. Florida Times-Union newsroom employees simply want a formal voice in how they will be treated when working for a profitable newspaper. I applaud and encourage the T-U employees. I hope my local newspaper, the St. Augustine Record, follows the example of their colleagues in Jacksonville. Three cheers!